Osteochondral defects of the talus embody a broad category of injuries from fibrillation of the articular cartilage to full depth loss of cartilage and bone.1 These defects are fairly common injuries that are most often linked with an ankle sprain or fracture. Chronic pain, swelling, subchondral cyst formation, functional impairment and end-stage osteoarthritis may result from a failure to treat an osteochondral defect properly.5 Bracing, physical therapy and immobilization are a few of the non-operative treatment modalities for osteochondral defects although most are refractory to conservative therapy. Berndt and Harty found that 75 percent of conservatively managed lesions had poor outcomes. O’Driscoll summarized the options for operative treatment of an osteochondral defect by stating that one can restore, replace, relieve or resect articular cartilage.7 Surgical treatments for osteochondral defects include an array of options ranging from a minimally invasive arthroscopic microfacture procedure to extensive ankle arthrotomy with malleolar osteotomies and fresh osteochondral allografts. At the University Foot and Ankle Institute, we have been following a stepwise approach in the treatment of osteochondral lesions that we will describe below. For lesions less than 1.0 cm2, we have found that arthroscopic microfracture surgery of the lesion in conjunction with bone marrow aspirate stem cell injection therapy provides good results with quicker recovery time. Also, the relative ease of performing this procedure arthroscopically makes it an excellent first-line treatment choice. Microfracture relies on the stimulation of marrow chondroprogenitor cells within the underlying marrow, which populate the fibrin clot in the talus defect and yield a fibrocartilaginous matrix.8 This unorganized matrix is composed of fibrocytes, chondrocytes and chondroblasts that protect the surface from excessive loading. We have found better results and greater patient satisfaction by augmenting bone marrow aspirate injection of stem cells with microfracture surgery. One performs the bone marrow aspiration at the time of surgery, taking the bone marrow from the ipsilateral calcaneus prior to exsanguination and inflation of tourniquet. The marrow then spins down and one injects the mesenchymal stem cells of the marrow directly into the ankle joint. The DeNovo graft is effective in treating lesions up to 2.5 cm2 but no larger than 5 cm2. Perform arthroscopic debridement on the joint and clearly define the lesion before suspending the graft in fibrin glue. Then place the graft into the lesion, making sure the graft fits flush. Enforce strict non-weightbearing for six weeks in a below-the-knee fiberglass cast, allowing the graft to incorporate into bone. Follow this with protected weightbearing in a removable cast boot for approximately two weeks. After removal of the fiberglass cast, physical therapy starts with range of motion exercises. We reserve the Osteochondral Autograft Transfer System (OATS) procedure (Arthrex) for lesions of moderate to large size (1.5 cm2 to 3.0 cm2) with frayed cartilage, necrotic bone and underlying fibrous tissue. This is a one-step procedure requiring harvesting the graft from a donor site and then placing the graft into the talar osteochondral lesion via an open arthrotomy. Enforce strict non-weightbearing for six weeks in a below the knee fiberglass cast, allowing the graft to incorporate into bone. Then patients begin protected weightbearing in a removable cast boot for approximately two weeks. Once the fiberglass cast comes off, physical therapy starts with range of motion exercises. Disadvantages with the OATS procedure include the limited accessibility of donor sites, which would facilitate the treatment of larger lesions. There is also a technical challenge of symmetry as round autologous osteochondral plugs fill irregularly shaped defects.11 Subsequently, the dead space between the circular graft and the unfilled lesion heals as fibrocartilage. Clinicians should consider the patient’s age, activity level, health and pain level when selecting the proper treatment regimen for osteochondral lesions of the talus. The location, size and stage of the lesion are also important factors to consider when choosing the appropriate surgery. Arthroscopic microfracture has proven successful in lesions smaller than 1.5 cm2 in patients 50 years old or younger but the technique is not capable of restoring the hyaline cartilage. Supplementing arthroscopic microfracture surgery with bone marrow aspirate has shown encouraging results in our experience. This method is less invasive with an early return to activity for the patient. New modalities such as the DeNovo graft have increased the number of treatments for osteochondral defects. The technique for the graft is relatively simple to perform, has low patient morbidity and stimulates hyaline cartilage. Also, one can use the graft to treat larger lesions up to 2.5 cm2 and it does reinstate the hyaline cartilage. Patients less than 50 years old with lesions larger than 2.5 cm2 or with prior failed surgery would most benefit from the OATS procedure. The OATS procedure is a more invasive technique and requires a donor site. Currently, there are many procedures for the treatment of osteochondral lesions of the talus. Each surgical modality has its indications as well as pros and cons. In our practice, we evaluate the advantages and disadvantages of each procedure, determining which is best for each individual case. 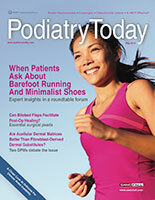 Dr. Chandler is a fellow at the University Foot and Ankle Institute in Los Angeles. 1.  Kruse D, Ng A, Paden M, Stone P. Arthroscopic De Novo NT juvenile allograft cartilage implantation in the talus: A case presentation. J Foot Ankle Surg. 2012; 51(2):218-221. 2.  Coltart WD. Aviator’s astragalus. J Bone Joint Surg Br. 1952; 34-B(4):545-566. 3. Bosien WR, Staples OS, Russell SW. Residual disability following acute ankle sprains. J Bone Joint Surg Am. 1955; 37-A(6):1237-1243. 4.  Ferkel RD, Sgaglione NA, DelPizzo W, et al. Arthroscopic treatment of osteochondral lesions of the talus: Long-term results. Orthop Trans. 1990; 14:172-173. 5.   Schacter AK, Chen AL, Reddy PD, Tejwani NC. Osteochondral lesions of the talus. J Am Acad Orthop Surg. 2005; 13(3):152-158. 6.  Berndt AL, Harty M. Transchondral fractures (osteochondritis dissecans) of the talus. J Bone Joint Surg Am. 1959; 41-A:988-1020. 7. O’Driscoll S. The healing and regeneration of articular cartilage: current concepts review. J Bone Joint Surg. 1998; 80-A(12): 1795-1812. 8.   Buckwalter JA, Cruess RL. Healing of the musculoskeletal tissues. In Rockwood CA Jr, Green DP, Bucholz RW (eds). Fractures in Adults. Lippincott, Philadelphia, 1991, p. 181. 9.  Chuckpaiwong B, Berkson EM, Theodore GH. Microfracture for osteochondral lesions of the ankle: outcome analysis and outcome predictors of 105 cases. Arthroscopy. 2008; 24(1):106-112. 10. Namba RS, Meuli M, Sullivan KM, Le AX, Adzick NS. Spontaneous repair of superficial defects in articular cartilage in a fetal lamb model. J Bone Joint Surg Am. 1998; 80(1):4-10. 11. Giannini S, Francesca V. Operative treatment of osteochondral lesions of the talar dome: current concepts review. Foot Ankle Int. 2004; 25(3):168-175.